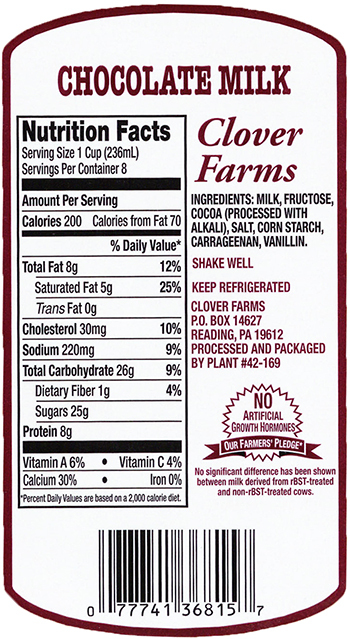 When it’s time to treat yourself, grab a glass of Clover Farms Chocolate Milk! Our Chocolate Milk is made from the finest and freshest chocolate ingredients and is carefully formulated and processed to produce an unparalleled high quality, great-tasting chocolate milk. Did You Know? Chocolate milk is healthy for children. It has an abundance of nutrients that children need for healthy growth and development. Children and teens who don’t get enough calcium, potassium, and vitamin D compromise their bone health and may be at greater risk of developing osteoporosis later in life. For children who don’t like white milk, chocolate milk offers a tasty alternative that helps provide the health benefits of milk and replaces less healthy beverages in their diets. Chocolate milk contains no more sugar than unsweetened apple juice. Reducing a child’s sugar intake from sodas, juices and candy makes more sense than reducing sugars from nutrient-rich foods like milk. Try some today! The smooth creamy flavor of Clover Farms Chocolate Milk will reward your taste buds and satisfy any true chocolate lover.